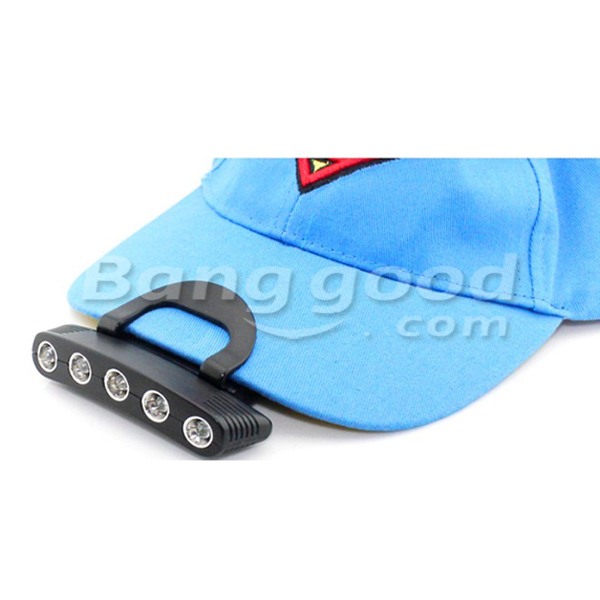 Snap might think he is fishing royalty because we call him "The Snapper King" but ever wondered what gear real royals use when they go fishing? Well now days they use the big brands we are all familiar with, but back in the day it was all hand crafted just for them, and they had some impressive kit. The below photo from the old Royal Palace in Copenhagen ,the Rosenborg Slot, and sent in by one of our readers (thanks Monksy!) shows handlines custom made for the Danish King and Queen. How's that for some custom gear? 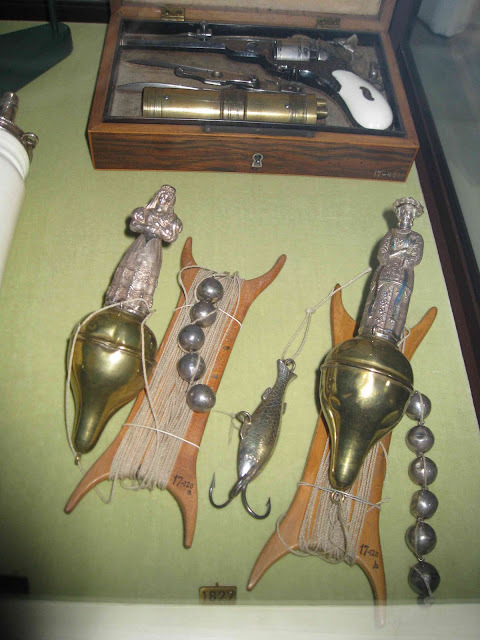 Note the differences in the little silver statues! Our reader can't say how old the kit is (the number at the bottom of the photo is a catalog number, not a year) but it's clear that these royal lines have been in the family for some time! The future Queen Mother in Aust 1927. ﻿The current danish royals are not reported to be fishers although they come from a proud maritime nation. Prince Frederik (married to "our Mary") certainly enjoyes boating, but appears to be more a sailor than a fisherman. We don't know if our own Queen Elizabeth II fishes although official photos taken for her 25th wedding anniversary in 1972 show her standing next to Prince Philip fishing at Balmoral, and just last year she opened a new wing at The True's Yard Fishing Heritage Museum at King's Lynn - close to her Sandringham estate, so presumably she is a fishing fan. 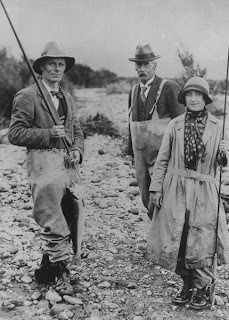 One great royal fishing lover was the Queen Mum (god bless her) who fished often including during her visit to Australia (while she was still the Duchess of York) in 1927 (see photo at right). HM Queen Elizabeth, the Queen Mother, as we know her, was quite handy with the rod and reel. 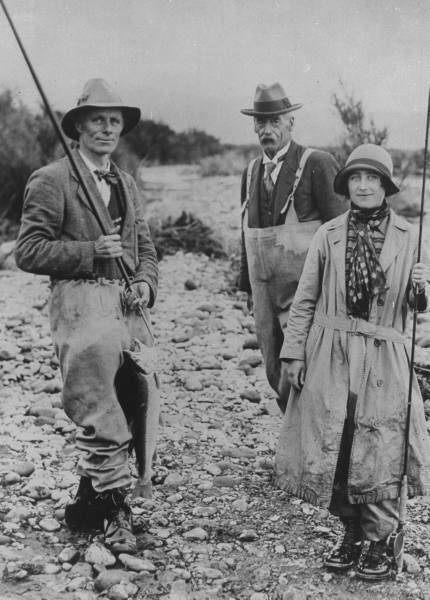 Media at the time reported that on 26th February 1927, The Duchess of York (as she was then) caught twenty fish in half an hour during a fishing trip in the Bay of Islands, New Zealand! Photos and reports show her still a keen fisherwoman well in to her later years. I always thought the Queen mum was a good sport. 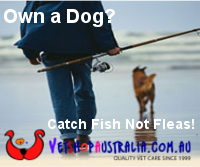 Now I find out she fished as well!